The Netherlands has a tremendous amount of interesting tech vendors, some of which get more attention than others. In an earlier post we discussed the lack of marketing power we sometimes see with Dutch IT vendors. 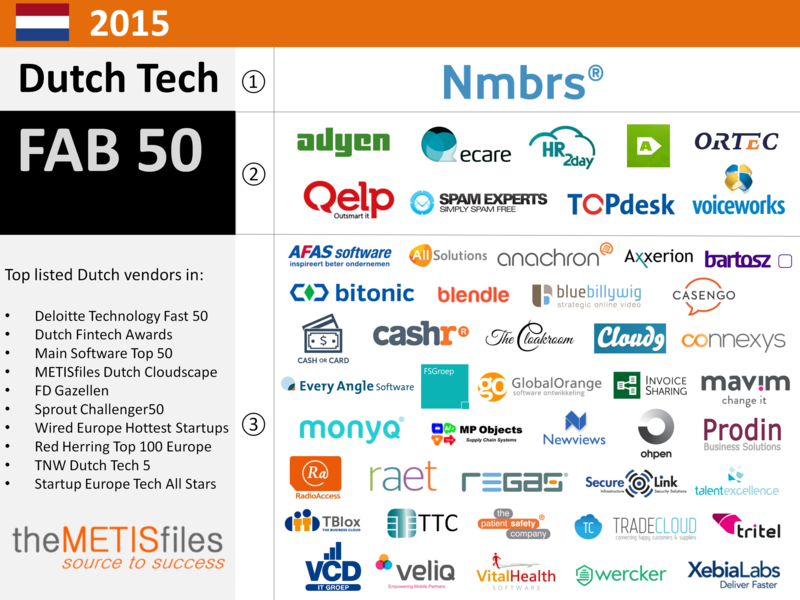 This time we take a closer look at those that are able to catch the limelight: the Dutch Tech Fab 50. Nmbrs, a provider of online (cloud) HR and payroll solutions, received the highest # of mentions. The company has offices in Amsterdam and Lisbon, employing approximately 50 people. Bright & Young: Blendle & Cloakroom are the youngest companies on the list. They have attracted a lot of attention and have grown to approximately 50-60 employees each. Bright & Young IT: Xebialabs, Ohpen and Label A (Bynder) are the new kids on the block. They are marketing IT solutions just a bit different than what we’re used to and are valued for the technological advantage that they have. Vertical Stars: Ecare, a provider of software solutions in the healthcare sector, provides assessment tools as well as a social network for care professionals. Ecare is one of the many startups appearing in the healthcare sector. Big & Beautiful: Raet & Afas, solid as a rock, have been around for a while. Especially Afas has been able to attract a lot of positive attention through its charity donations. So, what does it all mean? For one, these companies got noticed at least one more time than the other 500 (Dutch) vendors included in these lists. They have been able to create visibility around their technological capacity or company initiatives. On the other hand, the # of mentions are subject to whatever the criteria are that the particular list uses for selection. Companies like The Cloakroom and Blendle are digitized variations of fashion retail and publishing services. Like Uber and AirBnB they are part of the digital transformation. That does not make them less attractive, it just means that they have been able to smartly use an existing concept and digitize the service. Sometimes it is also interesting to see who is not on the list: a company like Quintiq for example, that was sold to Dassault in 2014 for €250 million. And Treatwell (founded 18 months ago and sold for €34 million) probably was just too fast to shine in any list. What Should The Hosting Sector Do To Remain Relevant?